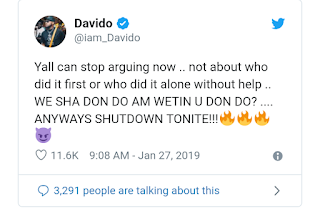 Davido has been on all social media accounts announcing his achievement on selling out the O2 Arena in London for his show that is holding at the venue tonight, but a fan of his has a different belief. London is about to witness a thrilling performance from Davido and his crew at the 20,000 capacity 02 Arena in London Today, January 27, 2019 and as announced by the singer, his goal is to sell out the O2 Arena just like Wizkid as been accomplished.However, a troll called out the DMW President on twitter for fake hype and extravagant lies that the O2 has already been sold out for his show slated on Saturday, 27th of January. 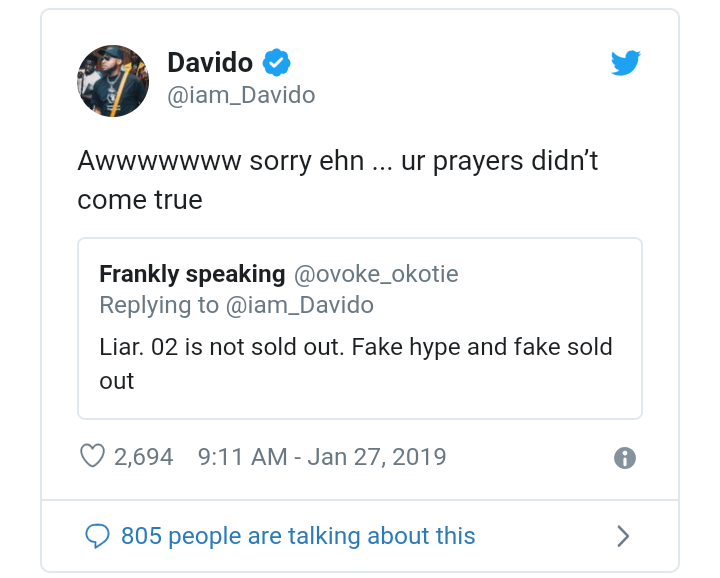 Davido had first cautioned fans to stop the debate on who sold out the O2 first between him and Wizkid. According to him, everyone sold it out and that’s what matters. Yall can stop arguing now .. not about who did it first or who did it alone without help .. WE SHA DON DO AM WETIN U DON DO? …. ANYWAYS SHUTDOWN TONITE!! !